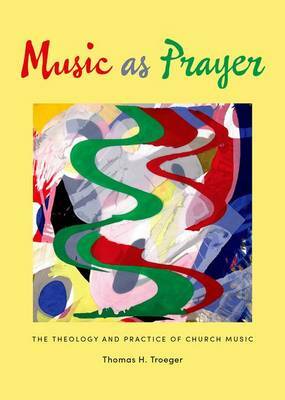 Music as Prayer explores the spiritual and theological character of church music. Author Thomas H. Troeger-a theologian, preacher, poet and flutist-traces how making and listening to music can be an act of prayer, a way of sensing the irrepressible resilience of the divine vitalities, in down-to-earth language that everyone can enjoy. The book employs a wide range of perspectives: from scientific observations about the affect of music on the brain, to the insights of early church fathers about the place of music in worship, to the compositions of great composers and their reflections upon their art, to the Bible and theologians, to organists, choir directors and instrumentalists, to hymnists and poets. Listening to the wisdom of these varied tribes, Troeger finds them to be a cloud of witnesses, a choir giving testimony to how music puts the human heart in touch with the spirit in times of sorrow and seeking, in times of joy and gratitude. The book is addressed to listeners and performers alike, instrumentalists and singers, clergy and seminarians, worship committees and congregation members, scholars and teachers of liturgy and sacred music. It helps musicians and clergy to develop a mutual understanding of the theological and spiritual dimensions of their collaborative work. As a whole, the book celebrates the ministry of making music that awakens people to those gifts of the spirit that sustain hope, promote healing, and enliven a visionary faith in the possibility of a transformed world.